All of the items above were on the list complete with Internet sites where they are sold and photographs. There was also a request for some special straps that he uses when he lifts weights, a couple of books and a fancy USB device that allows him to play movies directly from his computer to his television which for some reason doesn't have an analog port. Don't ask me, I was the recipient of this list, not the maker. 1) A blanket that mom makes for me. .....and almost not before New Year's. 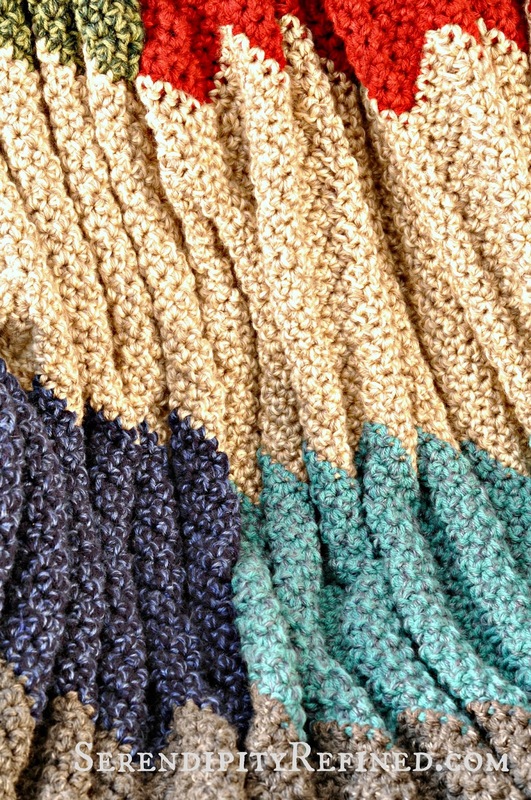 But a little over a week ago, the craft store had yarn on sale for 55% off and my son and I had a rare moment of simultaneous "free time" so we went to the store and chose yarn and, on New Year's Eve, I started his blanket. There wasn't a pattern. I just chained "a bunch" and started making ripples. I worked on it over the long weekend and in the evenings with the goal of finishing it by January 11th when he goes back to college. I vowed that I wouldn't do any other craft projects until this one was finished. ...with a couple of days to spare! (and just in time for the polar vortex that's hovering over northern Illinois this week). I did my best to figure out the "pattern" for what I made so, here goes! Let me assure you that this is not difficult to make. It has two stitches: "Chain" (CH) and "Single Crochet" (SC). That's it! 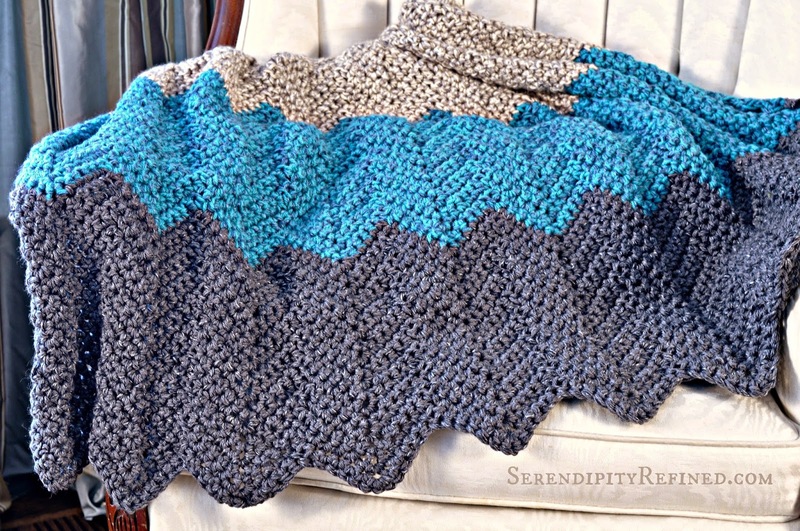 Note: If you make this blanket and find that there's a mistake in my directions, please let me know. I'm not too proud to make corrections! Eighteen 4.5 oz (268 yards each) of 4 ply yarn. *I used acrylic because this is going to college. 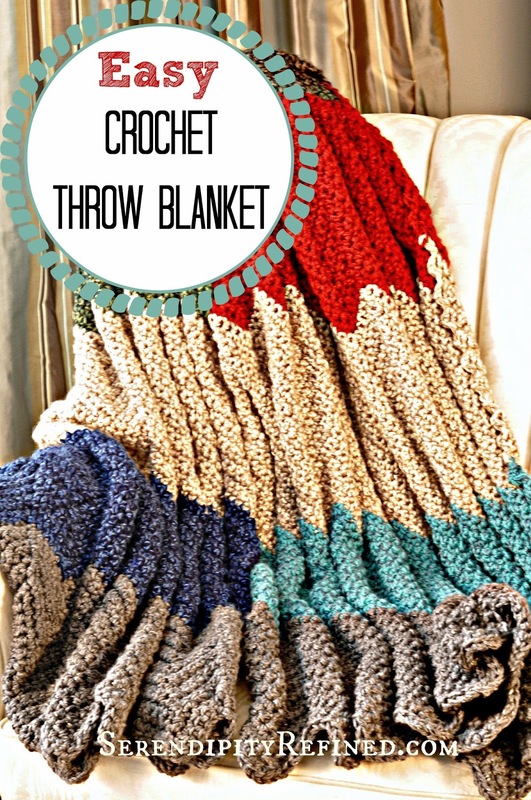 If you follow the directions below, the blanket will end up approximately 44 inches wide and almost 8 feet long. My son is 6'4" tall so I made it long. 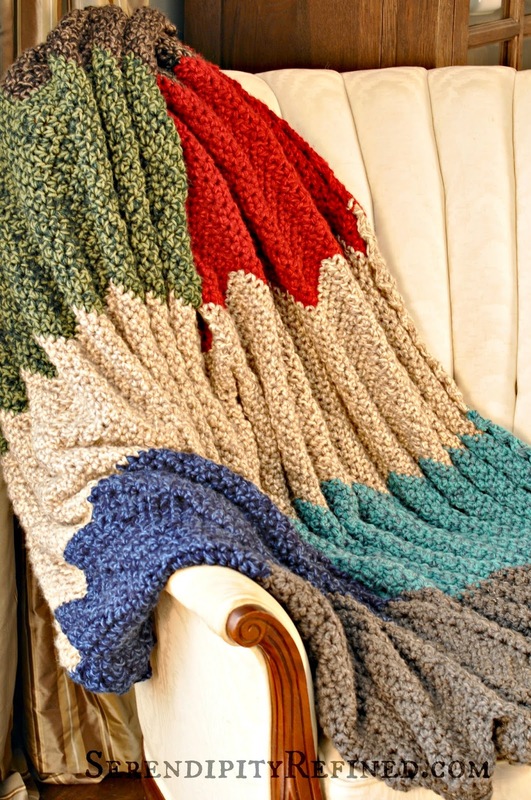 You can shorten by simply doing fewer rows of each color. Holding 2 strands together in the order shown above make a slip knot and CH 134. Row 1: Working through both loops, beginning in the second chain from the hook, SC in each of the next six chains. In the next chain make 3 SC. *SC in each of the next 5 chains, skip 2 chains, SC in each of the next 5 chains, 3 SC in the next chain*. Ten "ripples". Repeat * * until 7 stitches remain, SC in each stitch, CH 1 and turn. Row 2: Working through both loops, SC 2 together, *SC in each of the next 5 stitches, 3 SC in the next stitch, SC in each of the next 5 stitches, skip 2 stitches. * Repeat * * until 7 stitches remain, SC in each stitch, chain 1 and turn. Repeat Row 2 16 times (or more or less, I kept going until I was near the end of the skein and made all of the color changes on the same side of the piece. 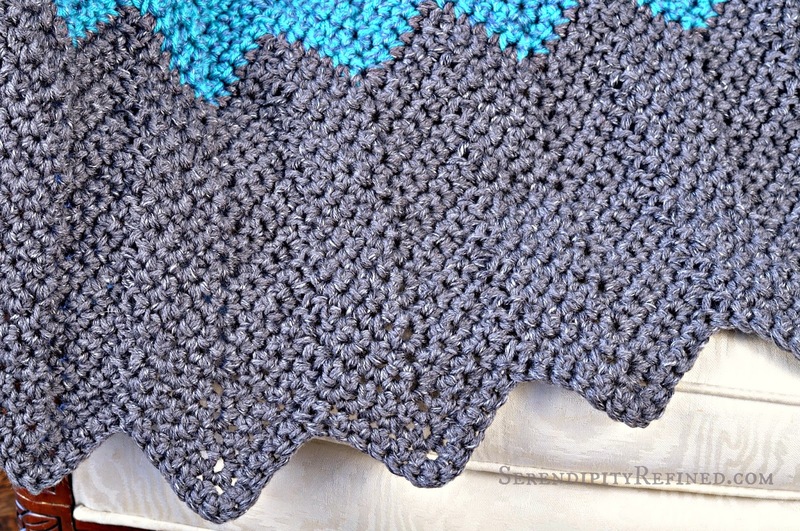 I'm excited that I was finally able to make my son a blanket "for Christmas". 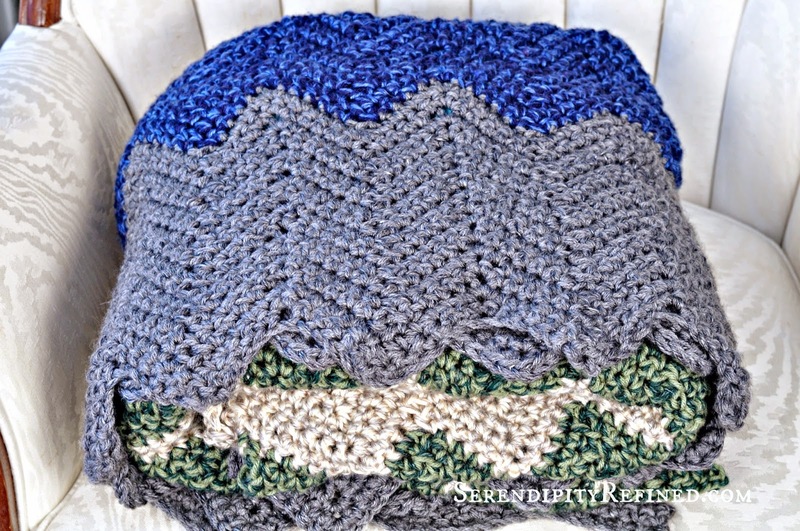 But the really important part for me is that my 20 year old son wanted a blanket that I made. That is the part that touches my heart the most and the very best Christmas gift that I could have received. I'm driving him back to college on Sunday morning. This means that I 'll be lonely and will have lots of free time to make Valentine's Day projects beginning next week!